Mark Glenn is not only the founder of the “Crescent & Cross” solidarity movement, he is also the only member. Mark Glenn has found yet another opportunity to attack the Greek nationalist organization Golden Dawn (Χρυσή Αυγή). He recently posted a relatively pointless article from the Jewish online newspaper Haaretz entitled: “Golden Dawn plays Nazi anthem while handing out food parcels – to Greeks only” on his anti-White, Islamophic blog, The Ugly Truth. An extreme-right political party in Greece played a Nazi anthem during a charity event Wednesday which the authorities had attempted to ban. A Greek version of the Nazi Horst Wessel song – known as “keep the banner flying” in Greek – was played on loudspeakers outside the central Athens offices of the Golden Dawn party, where members handed out bags of food and clothing. 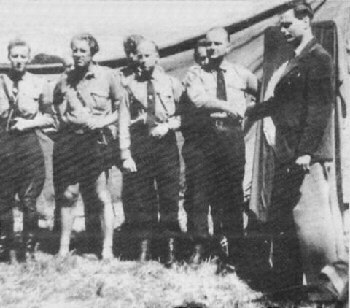 Horst Wessel was the unofficial anthem of the Nazis and the song is banned in Germany, along with Nazi symbols. One of the reasons that those with even a modicum of critical thinking skills have questions about these various ‘nationalist’ groups who carry a disproportionate amount of Nazi baggage with them [sic]. They may say the right things dealing with organized Jewish power, but if at the same time they are behaving like members of a cult that worships Adolph Hitler, at the end of the day they are serving Zionist interests, given the fact that the anti-Hitler propaganda is something that has penetrated the western mind down to the cellular level. Certainly any successful movement working against organized Jewish interests needs to tell the truth concerning Hitler, the Holocaust and to debunk the lies propagated about both, but to create a cult around these issues that will get NO TRACTION with the majority of people only gives groups like ADL, Simon Wiesenthal et al the ammunition they need to discredit all anti-Zionist groups, including those who have no affiliation with Hitler/Holocaust revisionism whatsoever. As far as I know, no White Nationalists have a problem with forming an alliance with the Muslims, as long as they are not being displaced by them in their own countries. Also, I’m quite sure that Golden Dawn, or anybody else for that matter, doesn’t need Mark Glenn lecturing them on how to run their affairs. And just to be clear, what Greece and other White nations are going to “get,” if White Nationalists don’t succeed, is genocided from the face of the planet! Hail Χρυσή Αυγή. Live forever. The Daily Stormer is a comprehensive news site for the White European Race. We will cover not simply news relating directly to the cause, but all areas of life which affect our people. The site will be updated multiple times per day, with both original stories and those drawn from elsewhere on the web – both mainstream and independent sources. We will also be featuring extensive video and radio material. The ultimate goal of the Daily Stormer is to provide a central point on the internet for racially conscientious White European people in America and across the world. Outgoing Iranian President Mahmoud Ahmadinejad said during a farewell ceremony that publicizing his Holocaust denial was a major achievement of his presidency. 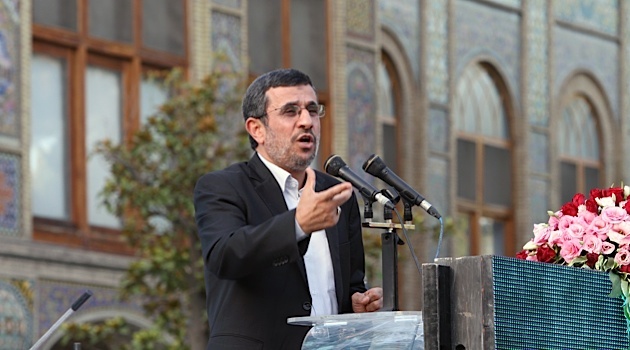 Ahmadinejad’s remarks on the Holocaust appeared on the Fars news site in Arabic, but not on its English website, which covered other aspects of the speech. Ahmadinejad also called for the Arab world to work together to punish Israel for its treatment of the Palestinians. President-elect Hassan Rohani described Ahmadinejad’s anti-Israel remarks as “hate rhetoric” that had brought the country to the brink of war, the German news agency dpa reported. I. WE BELIEVE that an honest man can never be happy in a naked scramble for material gain and comfort, without any goal which he believes is greater than himself, and for which he is willing to sacrifice his own egotism. This goal was formerly provided by fundamentalist religions, but science and subversion have so weakened all traditional religions, and given man such an unwarranted, short-sighted conceit of his “power over Nature”, that he has in effect become his own God. He is spiritually lost, even if he will not admit it. We believe that the only realistic goal which can still lift man out of his present unhappy selfishness and into the radiance of self-sacrificing idealism is the upward struggle of his race, the fight for the common good of his people. II. WE BELIEVE that society can function successfully, and therefore happily, only as an ORGANISM; that all parts benefit when each part performs the function for which it is best suited to produce a unified, single-purposed whole, which is then capable of out-performing any single part, the whole thus vastly increasing the powers of all the cooperating parts and the parts, therefore, subordinating a portion of their individual freedom to the whole; that the whole perishes and all of the parts suffer whenever one part fails to perform its own function, usurps or interferes with the function of another part, or like a cancer devours all the nourishment and grows wildly and selfishly out of all proportion to its task. III. WE BELIEVE that man makes genuine progress only when he approaches Nature humbly, and accepts and applies her eternal laws instead of arrogantly assuming to ignore and conquer Nature, as do the Marxists with their theories of the supremacy of environmental influence over the genetic truth of race, special laws of biological equality for humans only, and their insane denial of the primitive and fundamental human institution of private property. V. WE BELIEVE that no man is entitled to the services or the products of the labor of his fellow men unless he contributes at least an equal amount of goods or services of his own production or invention. We believe that the contribution by a member of society of nothing else but tokens called “money” is a fraud upon his fellows, and does not excuse a man capable of honest work of his responsibility to PRODUCE his share. VI. WE BELIEVE that it is to the advantage of society to see that every honest man has freedom and opportunity to achieve his maximum potentials by preserving his health, protecting his from unforseeable and ruinous catastrophes, educating him to capacity in the areas of his abilities, and guarding him against political and economic exploitation. VII. WE BELIEVE that Adolf Hitler was the gift of an inscrutable Providence to a world on the brink of Zionist -Bolshevik catastrophe, and that only the blazing spirit of this heroic man can give us the strength and inspiration to rise, like the early Christians, from the depths of persecution and hatred, to bring the world a new birth of radiant idealism, realistic peace, international order, and social justice for all men. THESE SEVEN PRINCIPLES are the rock of our faith. With them, we shall move the world. The political party program we adopt, based on these principles, can and will change as events and facts change, as we discover better methods. But these seven principles are fundamental, absolute, and timeless truth. They will not change. We bind ourselves permanently and without reservation to these ideals, and the battle to establish them as the only scientific and realistic basis for human society.